The piano pieces of Chopin changed the way the piano was played, not so much in the technical sense as with Liszt, but in the expressiveness required of the pianist. In shorter works, Chopin experimented with textures and sonorities, creating an utterly distinct piano style. 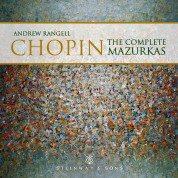 Perhaps the most unusual and individual of the shorter forms is the mazurka, which reflects the merging of Chopin's cosmopolitan influences in Paris with his growin consciousness of being Polish. While retaining the flavor and rhythm of traditional Polish dances, the mazurkas also reflect the sophisticated melodic nuances and the coloristic harmonies found in Chopin's other music. These brief, intimate evocations of his homeland are perhaps some of Chopin's greatest contributions to the piano repertoire. The four mazurkas of Op. 6 were not the first Chopin composed; he began writing them at the age of fifteen. The mazurka sets Opp. 6 and 7, published in 1832, were, however, the first of the genre that he published. The first piece in the Op. 6 set is the most rhythmically ambiguous, with the accented third beats and tied downbeats. The mournful, reflective thematic material is briefly interrupted by a much more joyous and rhythmically simpler interlude, returning shortly to the opening melody. The second piece in the set is more outwardly dance-like, with a triple-meter waltz-like bass line. The music seems fairly straightforward, but the play between the inner voices adds extra character and nuance. The third mazurka, marked Vivace, is the only one in a major key. Its accented third beat and its rhythmic drive add animation to the set. The interplay between the flashy right hand and the sneaky left-hand melodies also adds to the fun. The final piece in Op. 6 is very brief, with a recurring, spinning melody that gives the impression of a carousel.